Delta2D has been created based on the input of 2D gel analysis experts to supply a product that helps to analyze 2D gels simpler, faster and more reliably. Analyze DIGE as well as normal experiments, use advanced statistics and visualization methods - all in one software package. New to Delta2D? Not a problem at all. Just use the Workflow panel and let Delta2D guide you through the analysis project. Though we don't say "lean back and let the software do the job" (since projects are much too different), we think analyzing gel images has never been easier. Throughout the analysis, Delta2D gives you opportunities to do cross-checking, e.g. 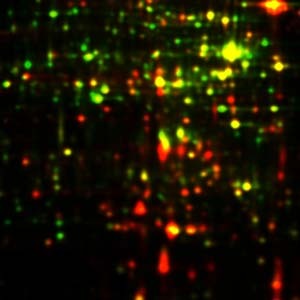 dual channel images to assess the warping, or direct display of the spot background image to assess quantitation. Running replicates is not only recommended but usually requested by supervisors and reviewers. Large projects demand for advanced statistical methods as included in Delta2D. Furthermore, reliabilty of statistical analysis can be increased if the number of missing values in the data set is minimized. Delta2D's advanced methods, as recommended in the Delta2D Workflow, help to completely avoid missing values and realize 100% Spot Matching across all images in your project. Presenting results is much easier if you can visually show the most important aspects of your findings. Enrich with appropriate images what you have found by quantitative analysis. 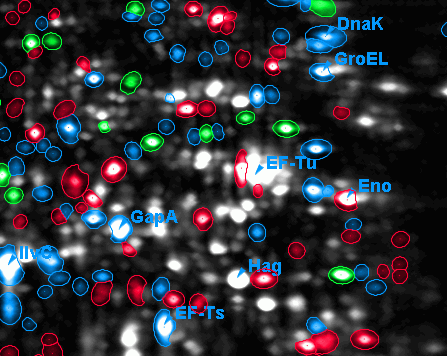 Based on gel images, which are typically presented as gray level images, changes in expression levels can be coded into colors, or spot clusters showing a similar response to your experimental conditions may be highlighted with representative colors. Present changes in interesting expression profiles by showing that the respective spot is matched correctly across all images. A number of papers has been published - based on work with Delta2D. Export capabilities to MS PowerPoint or MS Excel are standard. Complementing by powerful and customizable html reports define the state-of-the-art today. Since we are aware of limited budgets, we like to offer our solutions with highest quality at affordable prices. you will find an option that meets your needs perfectly. Though pricing models vary, you will always get the same Delta2D - there are no additional plugins for statistics, automation etc. you would have to pay for.